Uranium Mining: With its 185 reactors Europe is the world’s largest consumer of uranium. But Uranium as the basic resource for the nuclear fuel production, usually is imported from far away – from Kazakhstan, Russia, Australia, Canada or Niger, where the tailings are left behind to pollute the local environment. 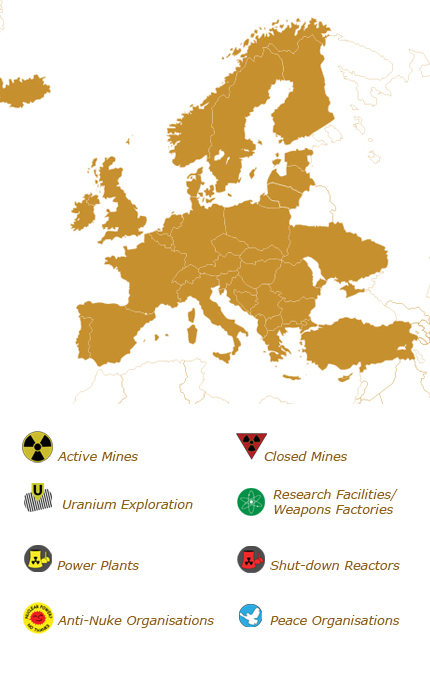 In the EU currently only two countries operate uranium mines, the Czech Republic and Romania, while all other mines were shut-down already decades ago. When nuclear power is considered as future energy supply, the needed resource needs to be taken into account. The past decades saw a decrease in uranium mining, because secondary supplies like government inventories and uranium from disarmed nuclear weapons was available. A comeback of uranium mining is a precondition to a comeback of nuclear energy. Several companies from Australia, Russia and Canada are trying to receive uranium mining licenses in the Czech Republic, Slovakia, Hungary, Poland, Sweden, Finland and Bulgaria. The three largest producers German Democratic Republic, Czechoslovakia and France together have produced 86 % of the uranium produced in Europe (without USSR) since World War II. The producers located in the Eastern Bloc held an 83 % share in the total production. 89 % of Western Europe’s 17 % share in the total production was produced by France. Current state: In Europe are 185 nuclear power plant units with an installed electric net capacity of 163.000 MW in operation (five thereof in the Asian part of the Russian Federation). 17 units with an electric net capacity of 15.000 MW were under construction in six countries (June 2015) – some more than ten years (Finland, France), the two units in Slovakia since 1980. 101 reactors were permanent shutdown. In terms of electricity generated by nuclear energy France holds in 2014 the top position with a share of 76.9 % followed by the Slovakian Republic (56.8%), Hungary (53.6%) and Ukrain (49.4%). The European Union with a total population of 500 million depends on nuclear power for more than one-quarter of its electricity. The non-EU European countries of Switzerland, Norway and the Balkan states Serbia, Bosnia & Herzegovina, Montenegro, Albania, Macedonia are to some extent electrically networked with the EU. Expected developments: Rising costs for new reactors are the main problem for the European nuclear power industry: The operator Teollisuuden Voima Oy does not expect more before the end of 2018 with the commercial commissioning Olkiluoto 3 on the west coast of Finland – the first new reactor after Chernobyl. The construction costs are meanwhile shot powerfully into the air: According to the International Economic Forum for Renewable Energies it will cost at least 8.5 billion euros instead of the originally calculated three billion. The planned construction of Unit 4 has been given up on the basis of this experience. The same happened in Flamanville in Normandy: The reactor will cost 9 billion euro instead of originally planned 3.3 billion. And the French nuclear company Areva was threatened to go bankrupt because of the dramatic delays in construction in Flamanville and Olkiluoto. Therefore the French state-owned EDF has taken over the reactor section of Areva in June 2015 – for around two billion euros. In Europe new reactor projects are only realizable if the taxpayers will carry the risk.